This is my first posting. I have been busy making all kinds of "thank-you" cards this summer, with a few family birthdays thrown in. The fact is, I have been enjoying these cards so much, I thought I should share my ideas with others who, like me, go on a search for new and fresh card ideas. The first card I'd like to share is called "A Cheery Hello" and features the ever-popular Flip-Flop. The flip-flop has become an icon as a symbol for summer, beaches, and cruise vacations. We see flip-flops everywhere: in jewellery, t-shirts, key chains, purses and the flip-flop is now a popular quilt design. It is so versatile you can use it on cards for birthdays, get well, hello, bon voyage, miss you, and more. 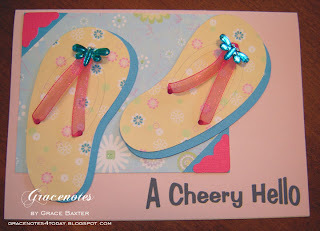 The fun flip-flops come to life with the addition of sparkly ribbon for the thongs and jewel dragonflies. I'd love to own a pair just like these ones!